Lost In Paris – Fiona’s orderly life is disrupted by a letter of distress from her 88-year-old Aunt Martha in Paris. She hops on the first plane she can and arrives to discover that Martha has disappeared. A wondrously fun and hectic tale of peculiar people finding love while lost in the City of Lights. A Bag Of Marbles – In occupied France during World War II, two young Jewish brothers, Maurice and Joseph, are sent by their parents to the free zone, and display courage, intelligence and ingenuity as they escape the occupiers and try to reunite their family. Good Time – After a botched bank robbery lands his younger brother in prison, Constantine embarks on a twisted odyssey through the underworld. Over the course of one adrenalized night, he finds himself on a mad descent into violence and mayhem as he races to save his brother and himself. 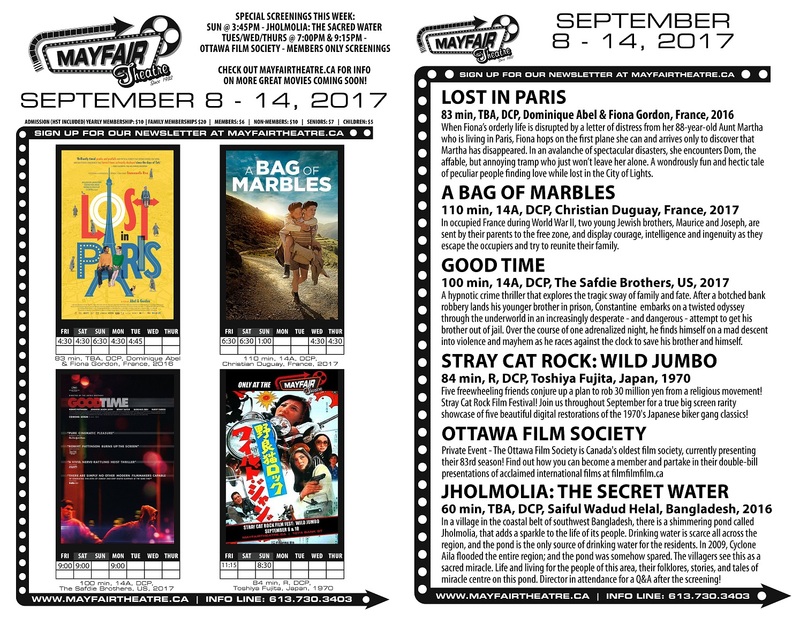 Stray Cat Rock: Wild Jumbo – Stray Cat Rock Film Fest! 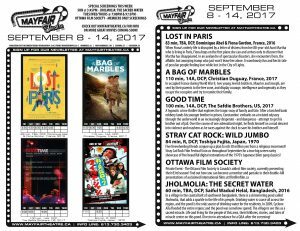 Join us throughout September for a true big screen rarity of five beautiful digital restorations of the 1970′s Japanese biker gang classics! This week, five freewheeling friends conjure up a plan to rob 30 million yen from a religious movement! Jholmolia: The Secret Water – At a village in Bangladesh, a pond adds sparkle to the life of its people. It is the only source of drinking water for the residents. In 2009, a cyclone flooded the region; the pond was miraculously spared. An intimate observation of the community in the aftermath of a cyclone. Q&A with the director after the screening!